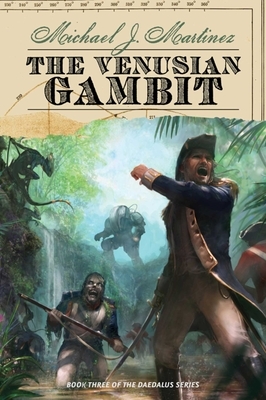 The last chapter of the dimension-spanning Daedalus series brings the 19th and 22nd centuries together for an explosive finale in the jungles of Venus! In 1809a Napoleonic era far different from our ownthe French have occupied England with their Corps Eternélle, undead soldiers risen through the darkest Alchemy. Only the actions of Lord Admiral Thomas Weatherby and the Royal Navy have kept the French contained to Earth. But the machinations of old enemies point to a bold and daring gambit: an ancient weapon, presumed lost in the jungles of Venus. Now, Weatherby must choose whether to stay and fight to retake his homeland or pursue the French to the green planet. And Shaila must decide if it’s possible to save the man she loves, or if he must be sacrificed for the good of two dimensions. In the dark, alien jungles of Venus, humanity's fate in both dimensions hangs in the balanceforcing past and present to once again join forces against an ancient terror. Michael Martinez is the author of The Daedalus Incident and The Enceladus Crisis, the first two installments in the Daedalus trilogy. A journalist and professional writer by trade, Martinez lives with his wife and daughter in northern New Jersey. "Overflowing with complexity and eloquence, the conclusion to Martinez’s Daedalus Trilogy seamlessly blends popular elements from science fiction and fantasy, producing a work that raises the bar for both."
. If you start this at bedtime, don’t plan on getting any sleep until you hit The End." "A true genre bender. It mixes alchemy, quantum physics, and historical figures in ways you haven’t seen before.... Adventurous, original, and a blast to read."